Need home decor inspiration? Check out these 13 modern living rooms for family-friendly decor ideas while still staying on a budget. A living room is such an important space in making a house a home! The past year, ever since going through Define Your Style course, I’ve struggled to make our current furniture fit in our home to fit our style. 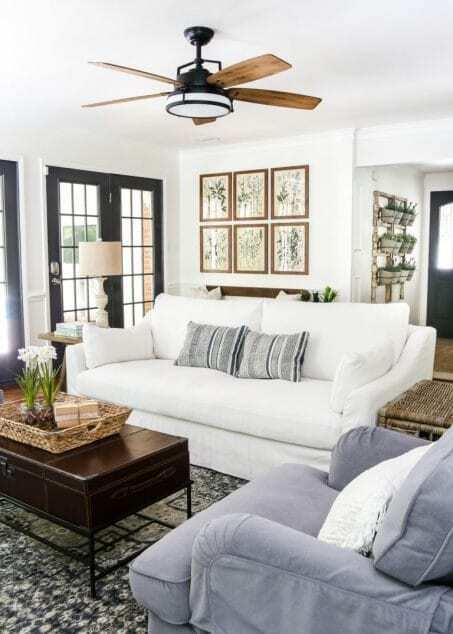 The living room tends to set the foundation for the whole decor of a home and the other rooms in the house often take their cue from the living room. Especially since baby #2 we spend so much of our day in the living room. 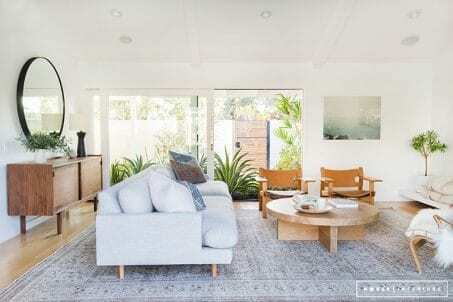 I can’t wait to show you the transformation we’re in the middle of, but looking at modern living rooms was the biggest inspiration for me as I planned out our new space. 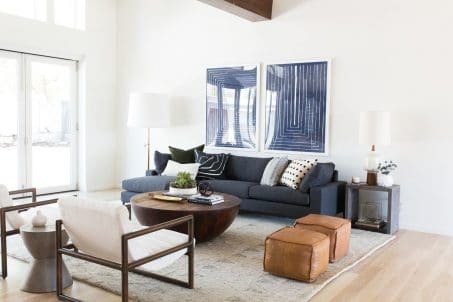 It’s really important for the living room not just to look beautiful and stylish, but for it to feel like a space you feel at home in: comfortable, peaceful, and inviting. 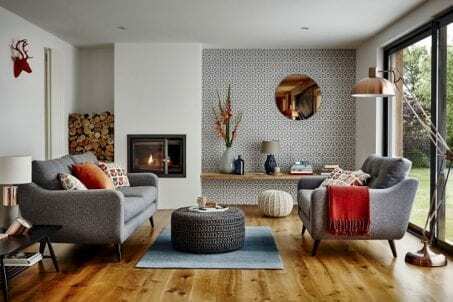 Decorating a living room for the first time or doing a living room makeover can feel like a daunting task! 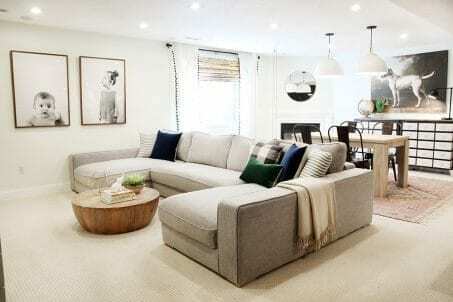 In case you’re planning a living room makeover, check out this gorgeous modern living rooms to give you some inspiration to make your living room the perfect fit for your lifestyle and family. This living room has the perfect feel for entertaining. While minimalist in decor, the accent wall and earthy chair and tables add warmth to the space without losing sophistication. 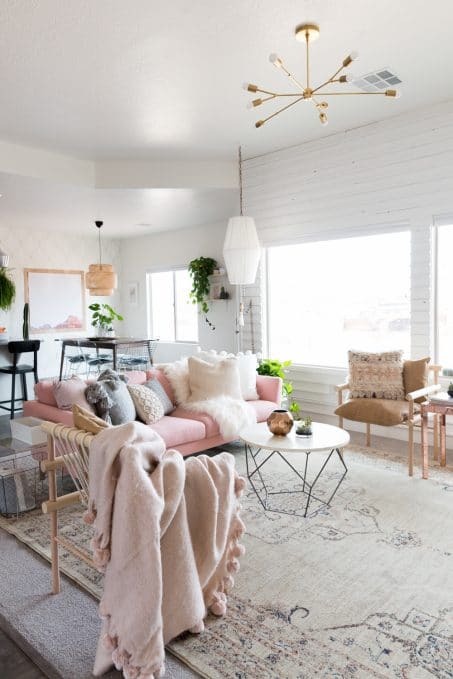 The soft tones of this living space make it the perfect spot to grab some blankets and watch a movie on a Friday night – or to have a steamy cup of coffee on a Saturday morning. I love this airy look! This rustic, modern room creates a welcoming space with its soft edges and face-to-face seating! I love the blend of colors in this living room! 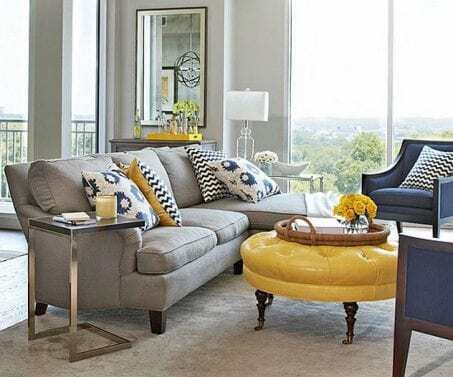 The pops of yellow add brightness and vitality to the gray and navy combo. And the vintage-style ottoman is perfect for a unique touch. I love the soft light and clean lines of this room! The symmetry and balance in this space instantly exude a feeling of peace as you enter. 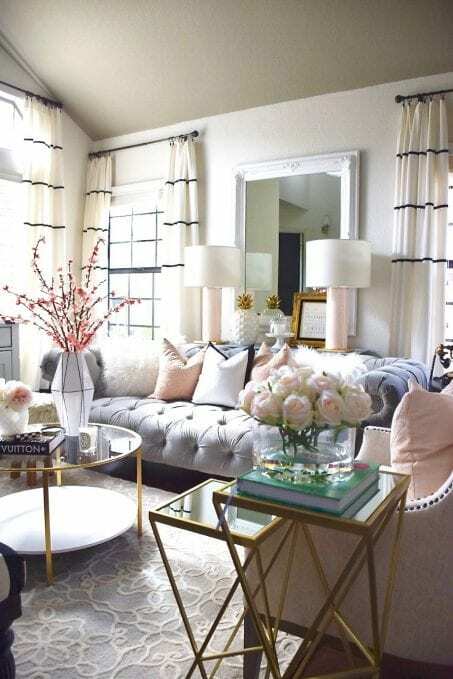 Plus, that coffee table is pretty much my dream style! This living room has so much cozy appeal! The pillows and blankets lure you in – it would be hard to leave and do something productive! Everything Mandi does is simply stunning and this makeover will not let you down! This is another minimalist room with clean lines and a soft touch. Mixed with the open floor plan, it is perfect for quality time with family and friends. They have done a great job mixing adult and kid-friendly home decor. This is a soft spin on a modern look. The pinks and grays are so gentle that you immediately feel relaxed. This is a girly-girl’s dream! The bright pop of turquoise with the mild grey and white backdrop are a perfect mix! It adds just enough interest to fill a large space. The patterned chairs are also a perfect pair with the rest of the decor. Another high contrast minimalist room that is clean and open without feeling cold. The dark blue couch and wall hangings mixed with the earthy table and ottomans offset the white walls perfectly, creating an inviting space. These vintage-looking pieces are the perfect touch for a minimalist mid-century look! It completely achieves a throwback feel with a modern touch. Plus, the pops of greenery help liven the place up a bit. This space has a bohemian take on a modern living room. The natural feel of the plants, braided hemp and the watercolor art softens the space and make it a welcoming area to spend time with friends! This takes a softer touch on a modern look by incorporating French Farmhouse decor. This one also adds in natural elements to create a soft, cozy, homey room without sacrificing style. Lauren has done such an incredible job making over this old home! 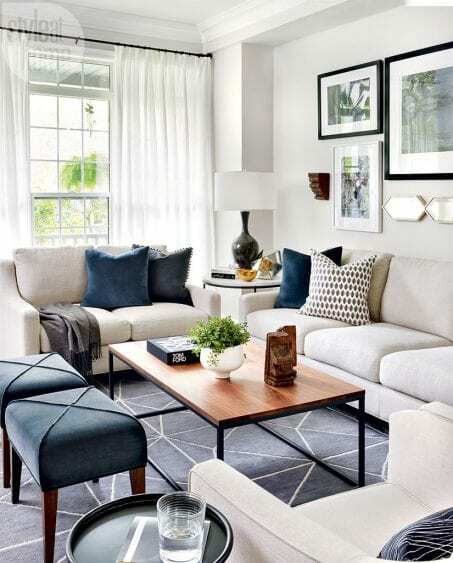 Living rooms are such an important space in a family’s home. It really communicates the whole vibe of the family and sets the tone for the rooms flowing out from it. There are so many ways to make this space unique to your taste while remaining true to your family’s needs and values. You don’t have to sacrifice style for functionality! These ideas show there’s a way to have both – beautifully! I can’t wait to show you what we’ve done with our living room! Not sure where to start in decorating? Check out how we defined our signature style in part 3 of a series here. It will get you moving in the right direction that is perfect for you!